‘Clarior ex Ignibus’ or ‘a light forged in fire’. For most students at Silcoates, this Latin inscription is simply the motto that can be read beneath the School’s badge, a central feature of which is a phoenix. The legendary phoenix was a bird which was said to burst into flame only to be reborn from its own ashes. 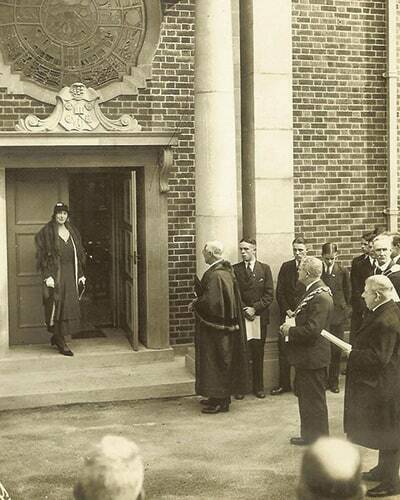 The Silcoates’ motto is a reminder of the rebirth of the present school after its predecessor had been destroyed by fire in 1904 and to the indomitable spirit of the founders in rebuilding from the ashes. The first school was founded in 1820 by a handful of Congregationalists who, with the example before them of a Lewisham school for non-conformists, decided there was a place for a similar school in the north. Silcoates Hall was bought from the Lumb family and The Yorkshire Dissenters’ Grammar School opened its doors. The next few years, however, saw only struggle and frustration: although in theory the Congregationalists wanted their school, they were slow to support it and, in the short space of ten years, it was forced to close. Its successor, a grammar school and commercial academy, also failed through lack of support. Though some of the promoters had suffered heavy monetary losses, they nevertheless were determined to try again. A third venture was promoted, this time for the sons of non-conformist ministers in the York and Lancaster dioceses. By the end of the first year, there were only twenty-two pupils, though the numbers rose to thirty six when the sons of ministers and missionaries were admitted from other counties. At Silcoates Hall, now leased to the School, the Headmaster and one assistant taught the boys in a schoolroom above the coachman’s house, an old building which is still in existence. Only when the sons of laymen were also permitted to attend, in 1842, did Silcoates begin to pay its way. Despite a few uncertain years, with the appointment of Dr Bewglass as Headmaster, the School began to develop, though financially its future continued to be precarious. More trouble lay in store. The lease of Silcoates Hall was almost at an end and the owner decided to sell. The Governors were faced with three possible decisions: to close the School, acquire another site or buy the estate. After much deliberation, they decided to buy: a bold step, for the price was £15,000. However, with little difficulty, the purchase money was raised and, in 1871, a new and enlarged Silcoates was opened with fifty pupils. It seemed as if, at last, prosperity was within sight. But troubles had not been left behind and the greatest disaster of all came in 1904. Silcoates was almost wholly destroyed by fire during the Easter holidays. Yet, out of tragedy, was produced the nucleus of today’s splendid school. The Committee, the Trustees and, most of all, the Headmaster, John Arthur Yonge, refused to give up. In spite of everything, Silcoates went on, at first in a small hotel in Harrogate and afterwards in a house in Saltburn. No school, however, could flourish for long in temporary quarters. To rebuild would cost at least £10,000 if, as was envisaged, Silcoates was to remain independent. Three foundation stones were laid on 2nd November 1907; one for Yorkshire, one for Lancashire and one on behalf of the Trustees. 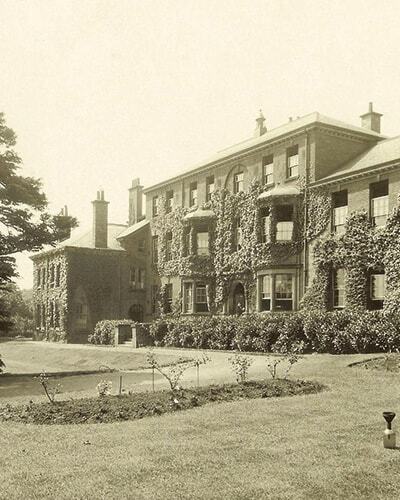 In October 1908, Silcoates began life once more, this time with dormitory accommodation for a hundred boys. It was a brand new school except for the original Silcoates Hall which, the only part to survive the fire, became the Headmaster’s house. The new school had laboratories and music rooms, a gymnasium, assembly hall and large covered playground, besides the usual form rooms, dining room and kitchen. Later, a swimming bath was given by the Old Boys. However, a school is about more than just buildings. Sydney Moore became Headmaster in 1918. His twenty-five years of outstanding leadership added immeasurably to the academic and spiritual progress of the school. Headmaster Mr Frank Spencer, who succeeded Mr Moore in 1943, devoted the seventeen years of his headmastership to developing the School and winning recognition for its status. A milestone in its history was reached when, in 1957, Mr Spencer was elected to the Headmasters’ Conference. By the time he retired in 1960, the number of boys had doubled, whilst friends, Old Boys and parents had banded together with a will to raise money for a new wing with five additional form rooms, a specialist geography room and library for the seniors (the existing library being handed over to the juniors). There were new tennis courts and a new cricket field where Wilfred Rhodes, then seventy-one years old, bowled the first over to Brian Sellars. In Wrenthorpe a nearby house was bought to accommodate another twenty boarders and, in 1958, a substantial grant from the Industrial Fund helped to modernise existing science laboratories and build new ones. Mr Spencer and his wife worked unceasingly to keep alive, even with the increased numbers, the intimate family atmosphere which had been born so long ago in the years of exile at Saltburn. Raymond Evans, an Old Silcoatian himself, followed Mr Spencer as Headmaster, and he and his wife also succeeded in preserving that family spirit. Helping to foster that family atmosphere, the Silcoates fag system operated in reverse of the usual order: seniors looked after the smaller boys, waiting on them at meal times and helping them, like older brothers. Dr Evans was, in turn, succeeded by John Baggaley in 1978, who did much to stabilise Silcoates during his tenure, metaphorically and literally, as several of the buildings were suffering from subsidence due to the legacy of coal mining. He also initiated the development of the Science and Technology building, which extended the classroom facilities of the School considerably. It is a testament to the robustness of Mr Baggeley’s designs that, even today, it is referred to as the ‘New Building’! Following his retirement, Paul Spillane became Headmaster. At the very early stage of his headship, the controversial but necessary decision was made to end boarding after 170 years. At the same time, the decision was also made to become fully co-educational. As well as presiding over a considerable growth in the number of pupils, Mr Spillane oversaw the construction of the Music School, providing a facility which has done so much to nurture generations of musicians at the School. When Mr Spillane retired in 2008, the School gave a warm welcome to Darryl Wideman. Silcoates was not immune to the downturn in the region’s economy following the recession of 2008-09 and some difficult decisions had to be made to remodel the School to place it on a firmer financial footing. As part of that restructuring, the decision was made to relocate the pre-school facilities so that now all pupils at the School are educated on one site. Several other major projects were undertaken, not least the Multi-Use Games Area (MUGA) and dedicated astroturf pitch, complete with floodlights, which were opened in 2013. The current Headmaster, Philip Rowe, arrived at the School in September 2017. Plans are already afoot to convert the Headmaster’s House into offices and meeting rooms, which will provide the School with a new reception area for visitors. Silcoates will celebrate its bicentenary in 2020. Despite that long ago fire, the School still stands on the outskirts of the villages of Alverthorpe and Wrenthorpe, high above the surrounding country and in the midst of 53 acres of lawns and playing fields. As an independent co-educational day school, educating children from 3 to 18, it remains a community which expounds high academic standards, coupled with an appreciation that the development of the all-round character of each child is just as important.